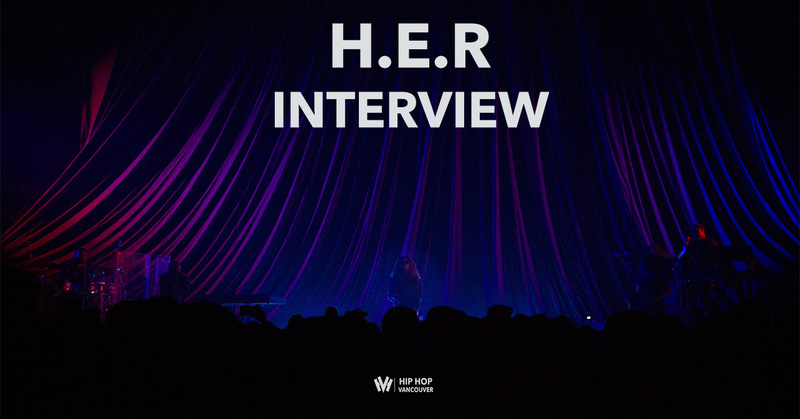 DJ Floetic caught up with H.E.R immediately following her performance on the Vancouver stop of the ‘Set It Off’ Tour. We chatted about her EP’s, relationships, who she would like to work with and more! HHV: We are in the second week of the tour, how has it been so far and what have you learned? H.E.R: It’s been amazing. I’m learning so much. So far we’ve been to Houston, Atlanta, LA, Vegas and my home The Bay. We have so much to transport. I’ve learned every single person on the tour counts, from the lighting to the sound, it’s all so important every night. HHV: We were in the crowd tonight. Your vocals and band are all planned out so meticulously. How much work went into preparing your set? H.E.R: It’s been months of work with my band and background singers. We’ve been working together for years, musically they are like my big brothers and sisters. We plan out the hits, timing and vocal moments but usually we are out there jamming every night. It’s something different almost every night. HHV: You released a prolific short film directed by Sean Frank. Can you speak on how that video came together? 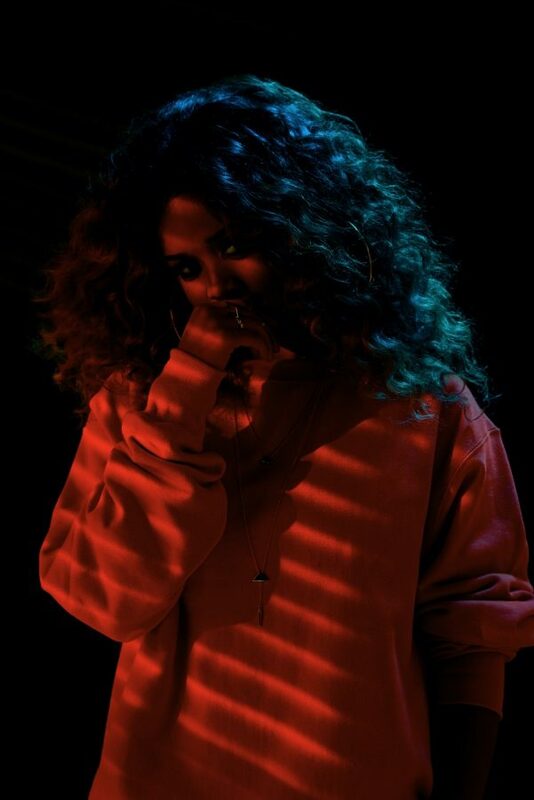 H.E.R: He wanted to do a video to my music, I just thought Id see what its about and was intrigued to see his vision. We talked through different parts of it. He did his thing. In the future I want to do my own visuals. It was a perfect introduction in what to expect doing videos. HHV: Can you speak on relationships being a common theme throughout your music. H.E.R: It’s an evolution of women, women in relationships and how men can affect your perspective on love. Being around different people in relationships shape you as a women and it’s something I represent. Its all stuff I go through. HHV: What are some of the things in the past that you dont want to repeat or qualities you are looking for in the future. H.E.R: Writing ‘Losing’ was me not really chasing, but sitting and waiting on someone to come take a hold of the situation and control it like all women feel a man should. A man taking control of a situation and really letting you know you are what he wants. H.E.R: He’s like a friend to me now. He’s really fun its great we are both doing our own thing. The first few weeks we haven’t had much of a chance to hang but we’ve been talking about music and after the shows we talk about the crowd. He’s been bringing me out in his set. HHV: What are some things in the future you are looking for. H.E.RTrust and good vibes. Not expecting too much and always giving without expecting something in return. In relationships it’s just love. We don’t have time to be in relationships that are iffy or flip floppy. Being young there are so many things I want to do, so if you are going to be around don’t add to stress…just good vibes. HHV: Outside of music, what do you do for fun? H.E.R Lately I’ve been loving to look at artwork. Im exploring my new neighbourhood Brooklyn. I’m not athletic or anything. A lot of expect me to be into sports but it’s just music all the time. HHV: Daryl Camper has been working with you for a while now. What’s your relationship with him? H.E.R: He’s my big brother, an extremely talented piano player, beat maker and singer. I just look up to him so much and we’ve grown so much together the past few years working on this project. He just comes in and plays the keys. Sometimes I play keys and he adds or we just talk and a song comes out. HHV: There have been some articles by prominent journalists speculating on your identity. Do you have plans of ever revealing the identity of H.E.R or will you try to conceal it. H.E.R: I don’t plan on keeping it concealed. Some people know. If they know they know. Eventually you’ll see my face a lot more. People feel like I’m hiding but I feel like I’m more revealed than ever through my stories. HHV: What’s your Fave colour? HHV: Fave place to eat? H.E.R: Any Mexican food spot in Southern California. HHV: Country you want to visit? HHV: Name an Artist you want to work with?